In LMP, we’ve decided to use Extensis Font Serve server/client font management tool. One of the reasons is being the fact that id has true server/client implementation. We can have all standard fonts stored in a place where they will not be altered and fonts that are used for specific jobs stored in other place. Added fonts are automatically appear in users’ client windows and are synchronized with the server automatically. Font Reserve Server/Client is quite good, one user adds font, others can see it. Supervisor, or senior staff members can setup Sets, share them and all users in the department would just activate fonts from that set to make sure they use right version of the font. 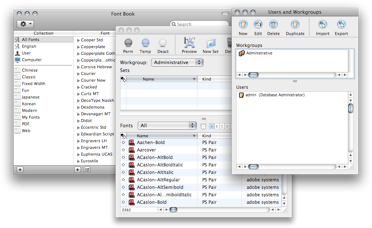 Font Book, provided with Apple OS X, is another font management software on workstations. Unfortunately you cannot use Font Reserve only and remove all fonts from Font Book. Helvetica is a required font for OS X to run as many other fonts. Microsoft Office adds 70+ fonts into the Font Book and Office components would freak out if you remove those fonts. Using right version of the font is important, but with two programs it is hard to figure out which application has the font you need, which font you are suppose to use, and what to do if fonts in the Font Reserve are not activating. One of the basic principles is make sure you have TrueType version of your fonts deactivated, before you can activate PostScript version. Trying to activate Helvetica in Font Reserve, some faces activate, some don’t. Open Font Book and deactivate Helvetica, then activate it in Font Book. By default, Font Book will have only required system fonts and MS Office fonts, but depending on your setup, it might be different. Deactivate all TrueType version fonts in your Font Book, PostScript versions of which you will be using and activate them in Font Reserve (those fonts might be: Garamond, Helvetica, Times, Zapf Dingbats etc. 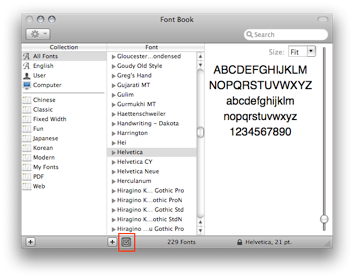 After you deactivate those fonts in Font Book, make sure you activate them permanently in Font Reserve. 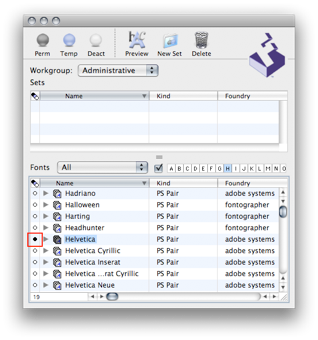 Fonts like Helvetica are required by system and if they are not activated permanently in Font Reserve, there might be a conflict, or system might decide to activate TrueType version from Font Book. Make sure you don’t have any applications launched automatically when you log in. Those applications might require certain fonts that are disabled in Font Book, and will request them before Font Reserve client is able to activate them. Having proper settings for Font Reserve are essential as well. Refer to Troubleshooting Font Reserve article for proper settings in Font Reserve client. Permanently activated fonts in Font Reserve client would stay activated even after you restart your machine, which is convenient, but having too many permanently activated fonts will slow down computer performance as well as add additional time on startup. Having not more than 100 fonts permanently activated will make it easier to manage them. Every time you open file which requires one or another font, Font Reserve auto-activation plugin will automatically activate the font, so you wouldn’t have to worry. From time to time you might have problems when after activating font in Font Reserve you still miss it in InDesign. As a mater of fact, you will miss these fonts in all Adobe applications. As you can see from this example Garamond family is active including Garamond Light, but Light is not appearing in InDesign font menu. 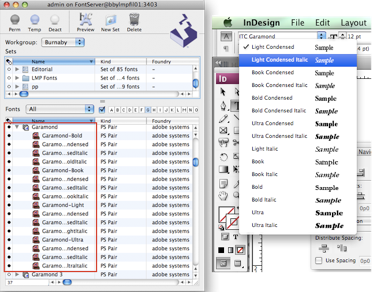 For that matter, Garamond Light would be missing from all Adobe applications including Illustrator, Photoshop etc. This is a sign of corrupted Adobe font caches. To clean it up quit all Adobe programs (InDesign, Photoshop, Illustrator, Bridge etc.) quit Safari as well, because it might be using Adobe Acrobat Reader plugin. Navigate to your Home Folder/Library/Caches/Adobe/ and delete following folders: Fonts, TypeSpt, TypeSupport. You might not have all three folders, so delete those that you have. Restart your workstation. Relaunch your InDesign and now you should have all activated fonts available.